Clean, crystal clear, worry-free drinking water. While water can taste odd at times and even appear cloudy in some cases, that alone is not enough to determine whether contaminants reside in your water. In order to scan for contaminants, proper testing is required. Only one drinking water system is advanced enough to eliminate nearly everything that is bad news to your home’s drinking water. *These contaminants are not necessarily in your water. **2007 NSF certification among reverse osmosis systems. The Aquakinetic A200 is a quality reverse osmosis system for the budget conscious customer who still wants the quality and reliability of a Kinetico system. The Aquakinetic A200 features complete NSF certifications, as well as quick-change cartridges for sanitary filter changes. MacGuard removes chlorine and sediment, heavy metals (e.g. lead), volatile organic compounds (e.g. pesticides and insecticides) and water-born parasites (e.g. Cryptosporidium). This unit is a simple and cost-effective solution for water treatment. iltration systme that provides clean, clear, thirst-quenching water right from your own faucet. That’s right. Your faucet will dispense the water you crave for watering plants, filling your pet’s bowl, brewing coffee, cooking without chemicals or drinking that tall glass of water. Unlike any other water filter on the market, Kube fits conveniently under your kitchen sink and connects to your cold water line. Your cold water runs through Kube where it is filtered and then dispensed from your existing faucet. You don’t need to attach anything to your faucet, push any buttons to get filtered water, drill any holes to install an additional faucet or mess with filling a pitcher. 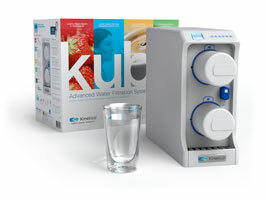 Once Kube is installed, just turn on your tap and enjoy your filtered water.